I volunteer at a preschool reading to a group of children. Lately, I haven’t been enjoying it. When I say lately, I mean for the past year. (Yes, I know. I am a fast reactor.) But, I feel like I should continue to do it. I’d feel guilty if I stop. My husband says that is classic liberal guilt. I don’t know what to call it. I suspected a negative thought pattern lurking in this situation. Although, as I understand it, some rational forms of guilt are healthy. It can drive our desire to empathize with others. It helps us keep ourselves in check, such as when your spouse is outside in the 95 degree heat pulling grass out of a planting bed that had grown into it from the lawn. He shouldn’t really be the only one doing that, should he? But, irrational thinking leading to guilt is something we’d do better dispelling. In many instances our guilt is driven by something conditioned in us. And, typically, it is attached to judgment. In the case of the preschool, I am judging myself. So, out of my July activity jar, amidst the “figure out how to preserve mangos,” and “attend yoga class,” I pulled, “how to dispel guilt.” Hmmm. How did I get so lucky? Byron Katie wrote a book titled, “Who Would You Be Without Your Story?” In this book, Katie outlines five steps to help us question negative thinking, or automatic negative thoughts. I preface these five steps with we must first be aware of them. It seems a little silly. But, it is common, especially with automatic negative thoughts, for thoughts to come and go largely unnoticed by our conscious. We react to them. But, we may not be aware of them. Awareness can be developed by quieting the fluctuations of the mind. Do I know absolutely that it is true? Pay attention to how you are reacting physically when you have the thought(s)… is there worry, concern, anger? Turn the thought around. List five reasons why the reverse of your thoughts could be true. I found step #5 to be the most powerful. If one is handling irrational thoughts, leading to guilt or otherwise, it can put those to rest; or, at least, challenge them. I am always on the lookout for what I think of as an “everyday” cake. 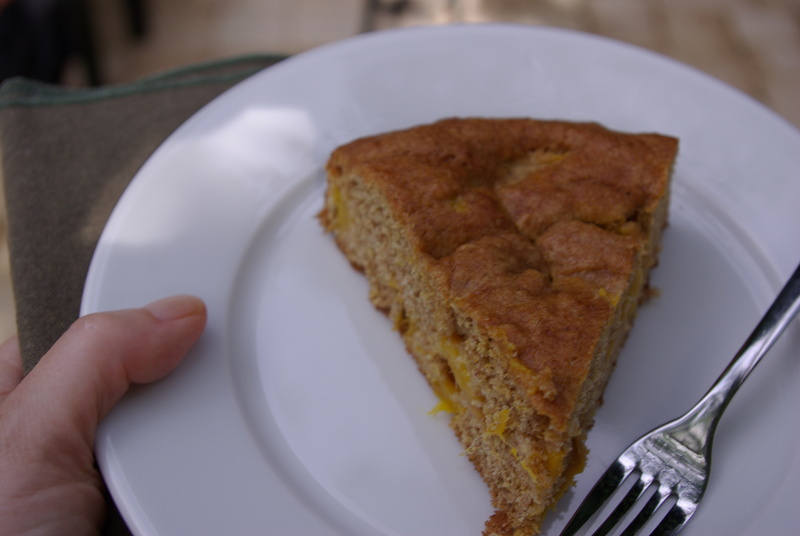 A cake that does not require eggs and butter to come to room temperature. A cake I can substitute oil for butter. 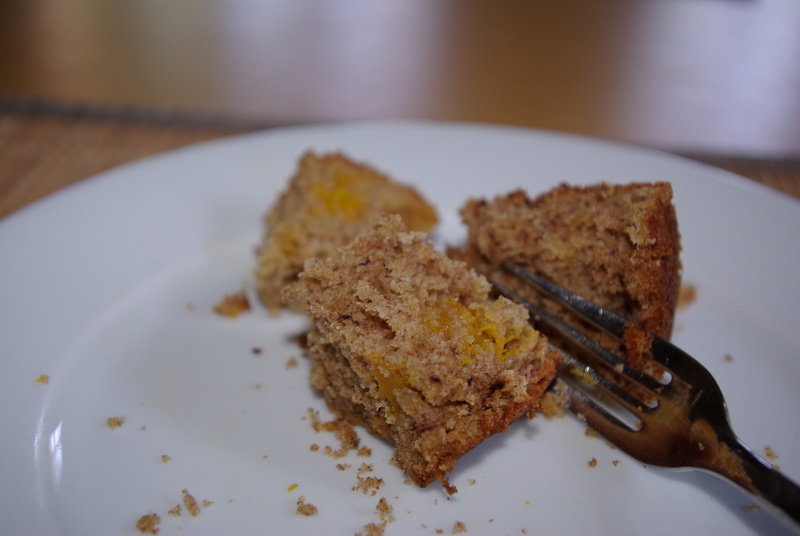 A cake I can make with a combination of whole wheat flour and spelt flour and reduce the sugar by half. A dessert I can pack loads of fruit into. About a year ago, I happened upon a cranberry cake recipe in Bon Appétit. Subsequently, I’ve overhauled it to incorporate those things I want. Swapping out different fruits with the seasons. 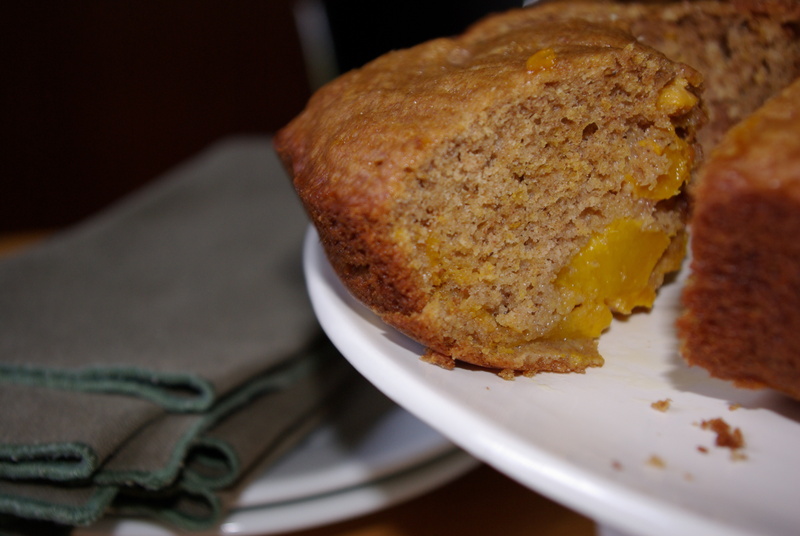 Since I make this dessert to withstand alot of fruit, it has more of a scone texture than it’s softer counterpart and it is not as sweet. Sometimes we eat it topped with honey. 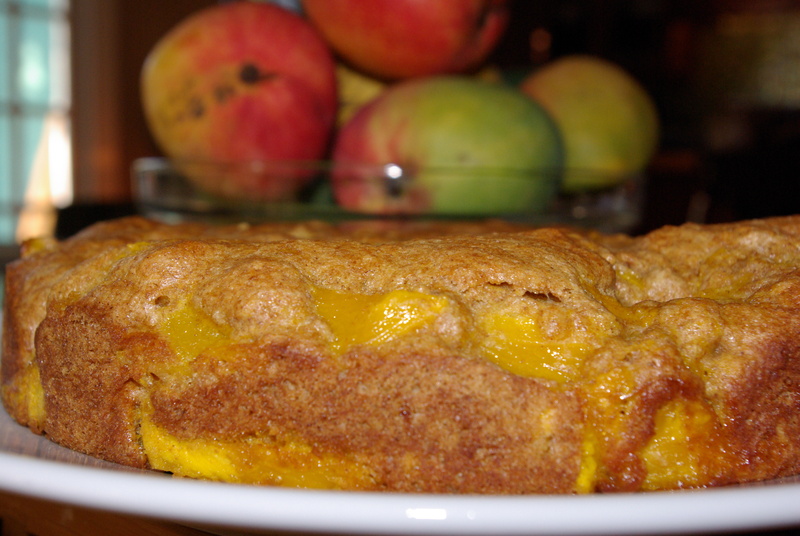 Recently, I made two versions of this dessert, Mango Banana Cake and Olive Oil Cake with Mango. Neither one of these sweets will make you feel guilty eating it. Peaches would be a good substitute for the mangos. Maybe peaches and blueberries? Before we get on to the baking recipes, a couple ideas for everyday dinners. First, an enchilada of sorts. 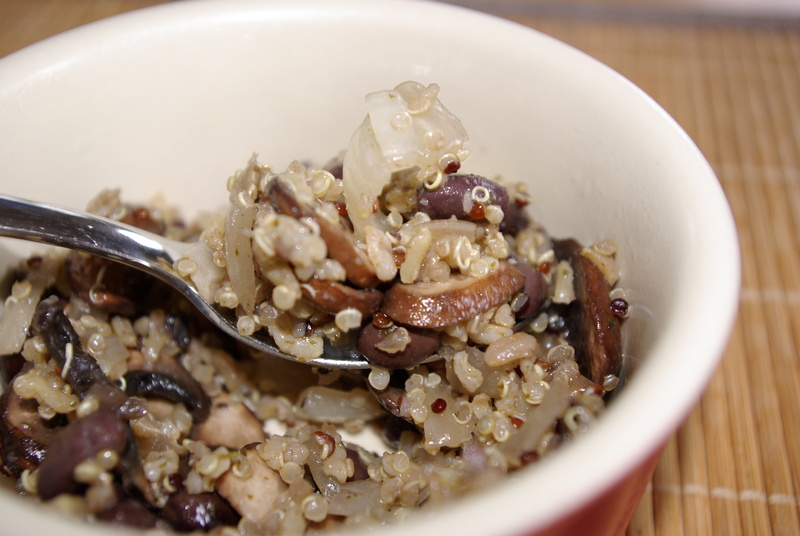 Sauté onions and baby bella mushrooms, add prepared quinoa and black beans. Season mixture to your liking. Fill tortillas with the bean mixture, add a sprinkling of cheese on top, and roll. Bake at 350 degrees until warmed through and tortillas begin to brown just a touch. Top with corn salsa and sour cream or plain yogurt and parsley. A summer pasta idea. Grilled vegetables, your choice, tossed with prepared pasta. (I prefer bronze plated pasta.) 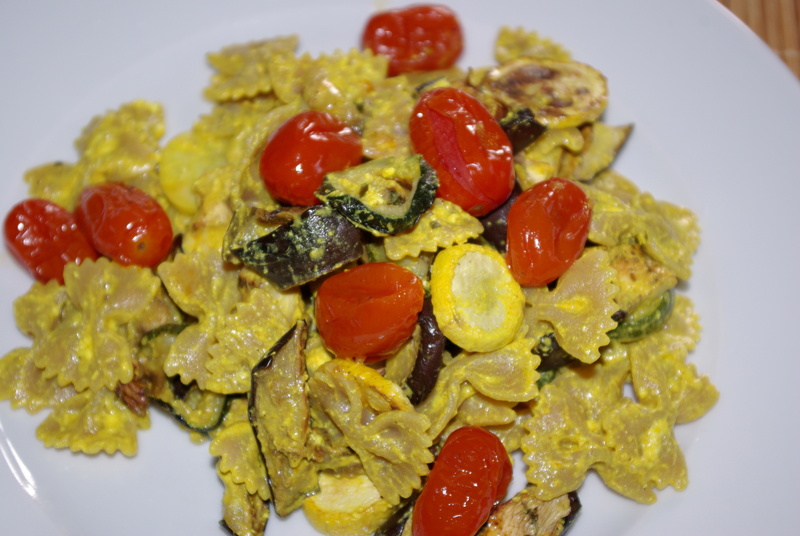 Mix grilled vegetables with prepared pasta, make a sauce out of room temperature goat cheese, plain yogurt, lemon zest and juice, black pepper, and turmeric for it’s anti-inflammatory properties. Combine the sauce ingredients and warm through. Stir into pasta mixture. Serve warm. Preheat the oven to 350°. Butter a 9″ round cake pan. Set aside. In a medium size mixing bowl, combine the dry ingredients. In another medium size mixing bowl, whisk together the sugar and oil. Beat the eggs and vanilla into the sugar mixture. Combine the flour mixture to the wet in thirds. (I’ve done this backwards many times. It seems to work. But those who know baking much better than I say to always add the dry to the wet.) Do not over mix batter. Stir just until incorporated. Gently fold in fruit. Pour prepared mixture into cake pan. 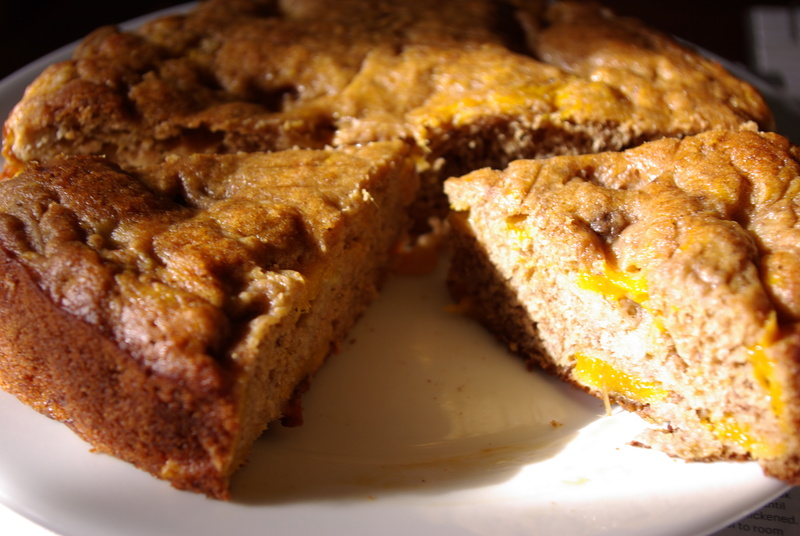 Bake until light golden brown and a knife inserted into middle of cake comes out clean, about 40 – 50 minutes. Let rest for 15 minutes. Then, after running a knife around the edge, turn out cake onto a rack to avoid it becoming soggy. Flip cake right side up to cool. Serve drizzled with honey, if desired. The wet ingredients are changed a bit in the next recipe. Combine the flour mixture to the wet in thirds. Do not over mix batter. Stir just until incorporated. Gently fold in fruit.